Are Colossal Kitec Costs Killing Your Condo Dreams? Don’t panic – We will pay for your Kitec Repairs. Whether you’ve already done it, are in the process of doing it, or know you’ll have to do it soon, we’ve got you covered. Click HERE to read more about how you can get reimbursed for your Kitec repairs. A flexible, plastic-wrapped aluminum pipe with brass fittings – which are a mixture of zinc and copper. 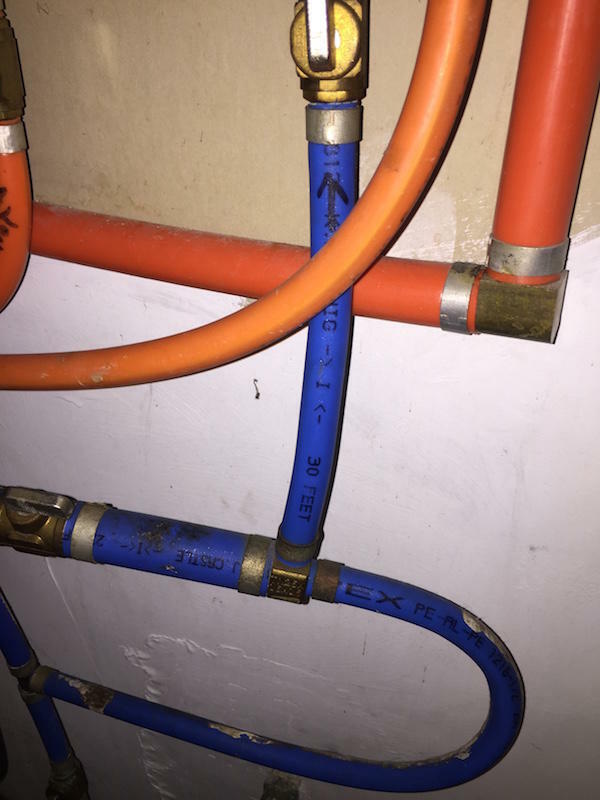 It was an economical and easy-to-install alternative to copper piping. Kitec piping was made and used extensively between 1995 and 2007 for potable water, in-floor, and hot-water baseboard heating systems. Most Kitec plumbing can be easily identified by its bright colours, usually orange/red for hot water, and blue for cold water, but it can also be found in white, grey, and black. Some popular brands for Kitec pipes are: Kitec, PlumbBetter, IPEX AQUA, Warm Rite, Kitec XPA, AmbioComfort, XPA, KERR, Controls, and Plomberie Amelioree, etc. Leaks, water damage, low pressure or clogging lay ahead for condo owners with Kitec plumbing due to fitting failures and disintegration of the pipes over time. While the issue can be discovered by a home inspector at the time of buying, a large number of pipes went undiscovered. If damage has occurred (due to Kitec), the cost to repair can be astronomical. It will no longer be a simple pipe repair but instead a large insurance claim for your walls, floors, personal belongings and potentially the belongings and repairs of units below or beside you. It was estimated that a quarter of condos built between 1995 and 2007 used Kitec plumbing and many new condo owners are coming to grips with an unforeseen and costly crisis looming behind the walls. The Kitech plumbing is a major issue because it is not a question of if it will fail but when. When buying and selling a condo or house, some are scared by the potential increase in maintenance fees due to replacements in the future. While other replacement fee concerns will fall on the owner entirely, since the piping system falls inside the house. Resale values may also decrease when buyers attempt to use the Kitec as a bargaining chip in negotiations when they see your Status Certificate. In any event, you (as an owner) will have to pay to replace the Kitech plumbing or pay for the subsequent owner to do so - place – We can help you. © 2019 Kitec Crusader. All rights reserved.